After a slow start, with mountain misty rain coming in as I put the first wash on the line, it has been a beautiful warm and sunny day. 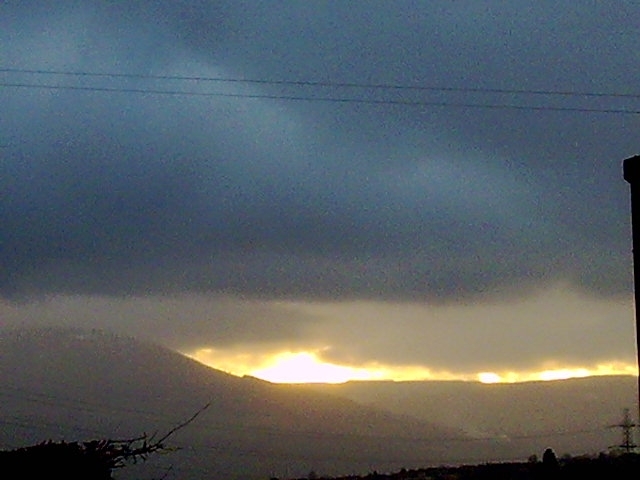 It has even stayed quite warm after 3pm when the sun went down behind Mynydd y Llan, over the valley. The traffic rumble has been my work accompaniment today, plus the sound of two grabs in the scrapyard over the valley sorting scrap metal. Pots went out to finish drying and I threw bigger bowls and vases and really went for it, with four platters out there drying too! I've just about finished the eight bags of clay I brought into the kitchen during the cold weather. I've opened three new bags and made a row of "hump backed bridge" shapes on three boards to dry it enough to throw. Unfortunately the car failed its MoT test- the handbrake wasn't holding firmly enough...but that was all, and the only advisory that needs dealing with urgently is an oil leak. As the village garage is spotless, I'm a bit ashamed of that...I thought the Oily One had sorted that a while ago. The Oily One and our local mobile mechanic will be back very soon, then I'll see how soon I can be mobile again. Now there are two overalls to wash and half a dozen small hand towels...I'm running out of enthusiasm!! After finishing this batch of sheep I went to see a friend. We'd not seen each other since about May 2009. Col could never understand why she loved living here in Wales instead of in a Mediterranean country...but appreciated that she loves the greenery of it here! He was such a home bird. Now she has her home here, a partner and their baby daughter. It was good to talk and to see her doing well. We wont leave it so long again! Talking and messaging online helps, but a cuppa shared is so much better. The bowls and jugs are drying slowly...too slowly...the fine misty rain rolled in just before 8am this morning, and the air is just damp. The air is coming from the Azores- warm and damp, for a day or so until the Continental air mass pushes it back and we get chilly again. Lets go make some pots to keep my mind off it!! 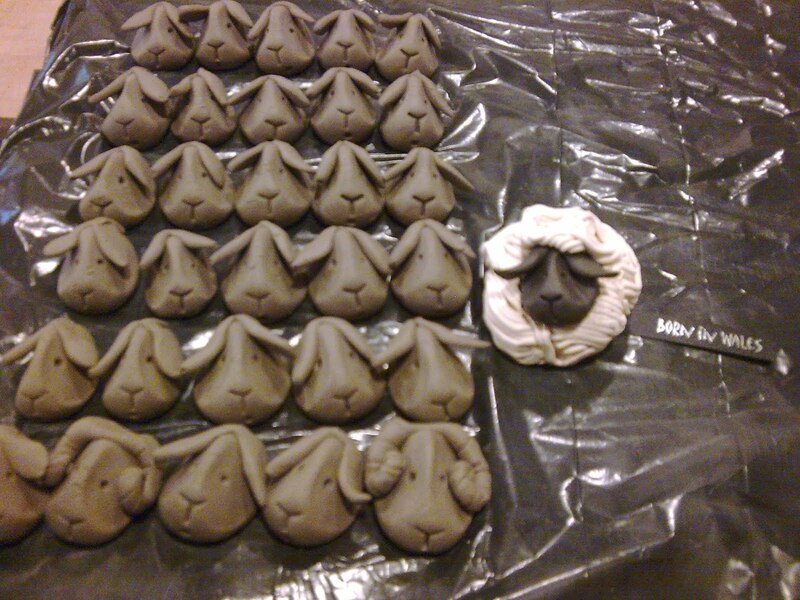 I was busy making sheep heads to start today. It feels good to get a rhythm going in the making, and to hear a blackbird shouting for all he is worth just outside! Back home via yet more food shopping- at least it wont be wasted! Then after a hunt for the "making list" for the gallery shop in Conwy I set to, armed with a mug of tea! Three wareboards full of jugs and bowls later...and nearly seven pm...the attempt at a larger vase failed. The clay was a little too soft and I was a little too tired!! I need to make two larger vases, at least two larger bowls and two more platters with writing on. Thankfully the weather looks to be warming up a little so drying them should be less of a problem. I've even left the fresh pots in the workshop as I don't think it will freeze tonight. Supper was good tonight- I made the omelettes, The Carpenter served the salad, and homemade bread with butter to fill the gaps. A meal shared in the making and the eating. Three weeks to get all the pots ready...help!! The first bisque firing went well today, but turning pots didn't. I turned through the bottom of a bowl, and the platters were not deep enough to have holes for hanging drilled in the feet. Six vases have been fitted with handles, and one has a small dragon. The salt pots are all done too, two with loop handles and two with a chicken each. I did a little light clearing and hoeing on the allotment and lifted the last of the parsnips. It was nice to be out in beautiful Spring weather, but I'm not feeling springlike, just rather lonely and a bit tired. The job today was helping with the signing on for the second of the "Icebreaker" series of Youth (under 16, under 14 and under 12 years old) track races. A series of three each run as a separate omnium event, each a month apart. Many thrills and few spills, so the racing was over in time for most to get to a television to watch THE rugby game!! ,which we won, apparently...I got home and packed the kiln to the sound of the cheers from the pub just up the road! Typical though....a beautiful sunny day when I should have had pots and clothes out drying, and there I am away and indoors. At least they had a couple of hours out in the fresh air. The Wizzard is down here this weekend, and apart from going to play cycle polo near Cardiff with The Carpenter he is cleaning up the Sick Laptop. It had managed to miss an anti-virus upgrade....the description was one word....riddled!! It is on its way to being clean and well, then linux will be installed. the lab hasn't messed up in fifteen years, WHY does it have to be me?!! So, replace temporary crown and go back again in a week. Therefore all I managed today was fettling the bottoms of ten jugs and seven small vases, then stamping and handling the jugs. My deadline is just looking too close!! On a bright point, I've got two full washes, and one of the Oily Ones to dry on the line!! It has stayed dry and nice here all day for a change, unlike the drizzly day that Cardiff has had! My brain has been working at seventy percent most of today.. I don't think that three hour meetings and late nights agree with me!! I've had a day near Abergavenny today, mixing glazes and drying pots in the sun. and just chilling instead of gardening! It has been a beautiful Springlike day, but with banks of grey cloud sitting on the mountains most of the time. A kilnful of mugs is being bisque fired as I write- it is good to work with friends! Cymdeithas Twmbarlwm Society held a public meeting last night. We held it in the largest room in Crosskeys Rugby Club and it was reasonably full. Present were CTS society members, at least half a dozen Commoners, local police (including the officer who is now the direct link for matters on the Mountain) councillors from the main two councils in the area, the landowners' representative, Ancient Cwmbran Society members, Environment Agency....and most important, more local people. Add to this a representative from the group that is making a difference to the area from Blaenafon across the Commons of the Heads of the Valleys, stopping offroad damage, dealing with flytipping and raising the awareness of their locals to the value of what is there. So much talk about the problems we have AND what has begun to be done by all parties. We need to find out exactly what is there too- Gwent is the only county without a proper archaeological survey. Yet as a border area for millenia it is stuffed full of evidence!! One excuse has been the industrial development of the area. Now that itself is archaeology. Look at the remains of quarries and mines and farming on the mountain, all fast being lost. We are at the point too of losing the people who can give eye-witness accounts of all this. So, much to do and heartening to see action. I've had two days on sheepmaking, and managed to turn and decorate four three pound bowls after getting home tonight, before the light went. Things look so different under artificial light, that the one left to do can be done in the morning to save spoiling it. It has been a dull and cold day, and it was drizzly with low cloud at teatime this afternoon. The saucers only needed my stamp on the bottom and a thumb running round the base. All that is left from the last throwing session is one three pound bowl to turn the footring and decorate the rim, and two platters to sgraffito the rim and turn. I should be able to have a good throwing session tomorrow and have the rest of the work for Conwy made. Then I'll have a month to finish and deliver it. On Thursday I'll take my glaze book- started in 1973! and we'll have fun rummaging through that to decide what is worth testing for the new mugs. It is good to have things to look forward to and to work towards. Something to aim for and friends to discuss it with, online and in person. Is what I call the time spent today on housework and shopping!! It was pleasant but chilly and subdued weather this morning, a bit of a shower by lunchtime but nothing much. I managed to get to the workshop well after 2pm and by 4pm it was setting in cold (and the roads had been gritted by 5pm). A dozen small saucers thrown with two extra for spares. I threw them on batts, partly as they would distort too much if lifted off by hand, and partly because if you're using 6" batts when making 6" saucers, it saves measuring! Most of the mugs have been packed into mushroom trays and stacked in the kitchen. Making bread has the side effect of drying the pots as it bakes, as they are next to the oven. As supper baked I finished a few salt pots- we have beasties, ducks and chickens plus the odd fish and twisty handle too. The forecast for this weekend was Wet, Windy and Wintery....it was right!! As we returned from the Allotments Committee meeting I'm sure that the rain was a little solid. The sun is out again now, but I'll not be tempted to do any clothes washing! Yesterday I worked in the garden near Abergavenny, carrying on with the tidying up after a pruning session and clearing more brambles to reveal a corner full of rasberry canes. After lunch the new mugs were ready for fettling and sorting. I rejected five out of the twentyfive. There is no point keeping something that is not quite right and thinking "It'll do". Then I had a practice throw with porcelain, something I haven't done for a couple of years. It was interesting throwing on 6" square (15cm) biscuit tiles that fit into a recess on a rubber wheelhead that fits over the metal wheelhead. You can get a mug much nearer the finished article than if you throw and lift off and there should be far less fettling to do as well. Today I have started adding handles to the Espresso cups. Then there are salt pots to be finished and saucers thrown for the cups. The bowls are almost ready for turning and decorating and the platters are waiting for slip and sgraffito. It is all go again! Most of the handles have been done, and five bigger bowls thrown last night. They came easily, such a relief, although the larger (2kg) platter needs stiffer clay..the rim collapsed! Finish the handles and salt pots to warm up, then more throwing. The allotment needs attention, but the soil is cold and damp and more rain showers forecast for this afternoon. Some tidying of the established strawberry bed could be in order if I'm lucky. On Monday evening a noise was heard..obviously low, obviously more than one plane. I remember that happening in 1977 in Dyffryn Clwyd when a similar pair went up the middle of the valley at under 100 feet....it was all denied and you were almost asked if you got the registration number!! We reckoned they were lost, too! Here they are, for those who haven't met them before!! 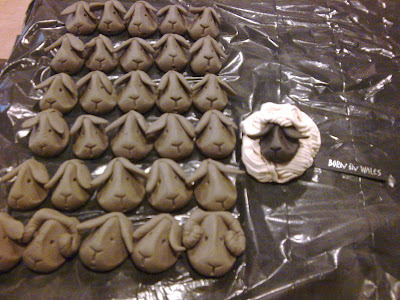 I'm back making clay sheep for two days each week!! I'm not sure how long for, but every penny helps. Tomorrow I need to make bowls, and cups and saucers for Espresso coffee! It has turned milder for a couple of days, which has made travelling to St Ffagans easier to make the sheep in the pottery there. Will it turn colder again now I need to get out there in the workshop and throw?!! It will be when it get sorted....and when I get my own laptop computer soon, that will be Linuxed too!! Until then I'm back on The Carpenter's computer, as and when!! Today has been mainly ironing and washing and baking. Bread and cake, pudding and savoury too. It has turned warmer again, and damp, so that when The Carpenter went out on his mountain bike for an hour or so, he came back VERY muddy!! Further up the mountain it was still icy, so he went easy and cut out some sections of the trail. My baking didn't stop The Oily One getting a sliced loaf of bread when he eventually went shopping...at least it was instore bakery bread, not packet sliced "bread". Eighteen small mugs have dried enough to be stacked in the mushroom trays. A dozen each of belly, straight and flared medium mugs have been fettled, stamped and wrapped individually, and the clay almost dried enough to pull handles. Seven salt pots have been wrapped , I don't want them drying out too much!! I was supposed to have been finishing all those today, somehow I run out of "me". You can just about see the freshly thrown pots steaming in the sunshine!! Result, 23 pots @ 7 minutes each. I lost a couple near the end as I was pushing to finish a boardful- not wise when it is beginning to freeze! I'd be happier if they were taking five minutes as that would be two hours plus throwing instead of getting on for three. I know I'm not turning, or hardly atall with the salt pots, but it just doesn't seem much work to show. It will probably get quicker in warmer weather. I throw with slip, so I leave the lid off the pot so that it will dry overnight, and add hot water. Both the slip pot and the clay are in the house so that they don't get ice-cold, let alone freeze!! The sky was still clear most of ther afternoon, so I'd say that we have another cold night to look forward to. 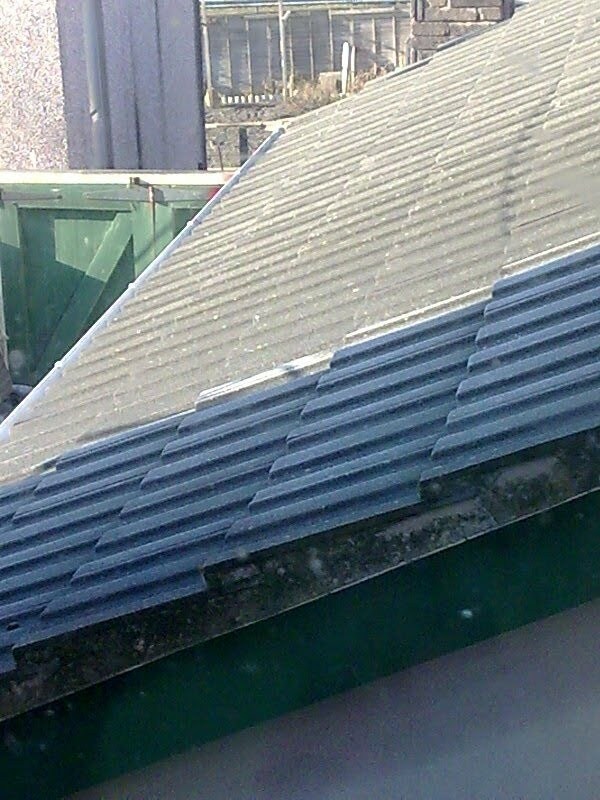 It is still a bit white up there...and the worshop roof is nearly de-frosted down here. (400 ft above sea level). 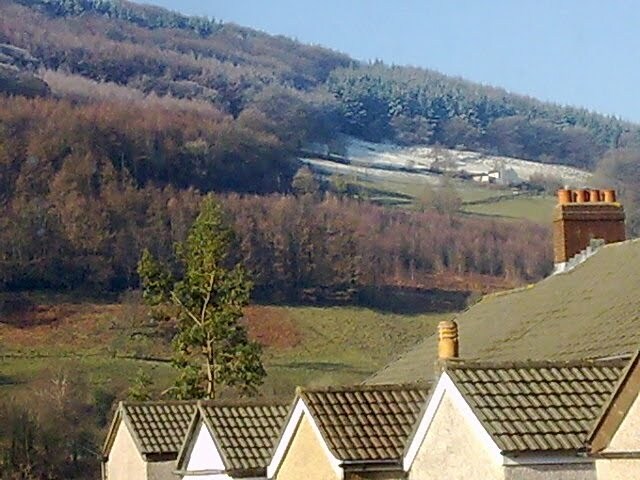 It is so beautifully clear and sunny after a hard cold night last night and it is only above freezing in the sunshine. Temperatures last night fell widely below minus 10 degrees Celsius across parts of southern and eastern England with Holbeach in Lincolnshire recording a minimum -15.6C, making it the coldest night of the winter so far and also since Boxing Day 2010. Issued at 0900 on Sat 11 Feb 2012. " Washing up done and kept, cat fed, clothes mostly dried and distributed to their owners, kitchen tidied. The first ten balls of clay are weighed and ready, just finish my mug of coffee and "we're ready to roll" !! As I had work in the Craft in the Bay Summer Show last year I was asked if I'd like to have five pots in their "past exhibitors" display. I delivered five saltglazed jars and boxes today. I'll have to get a photo of them in situ next time I visit the gallery/shop. Then a browse around a certain Swedish store for inspiration (and free coffee!!) and a couple of useful (and will be used!) items for the kitchen. Next a visit to another gallery run by a workers' co-operative to deliver a storage jar that I've bartered (along with a bowl) for a lino print. Then the official reason for today's trip to Cardiff- one tooth having the preparation work for a crown. Temporary on, real one in a fortnight. I came out of the dentist's surgery to...snow!! Naturally I thought of The Carpenter who is commuting by bike....a quick phone call, and yes, he could finish half an hour early!! The snow didn't last long, but we did stick to the main road to go home. Having company on the journey home was enjoyable too, good conversation and plans discussed too. Time for a cuppa then out again to the velodrome...definitely a day on the move! I was glad to get home to a simple supper made by The Carpenter...steamed potatoes, salad and pizza....next step is to teach him how to make the pizza from scratch instead of taking it out of the freezer!! This morning was full of the jobs that don't count to many people- as they weren't throwing pots on the wheel! Dealing with post and emails, checking online, Etsy and facebook page for enquiries- and finding a "thankyou"! kneading and weighing clay for throwing. Plus waiting for the sun to creep round to the workshop!! Once it had, I threw a dozen straight sided medium mugs. Once I get into a rhythm, mugs take seven minutes...which seems a lot, but not once you consider that they wont need turning, just a quick fettle, add the handle and impress the decoration. 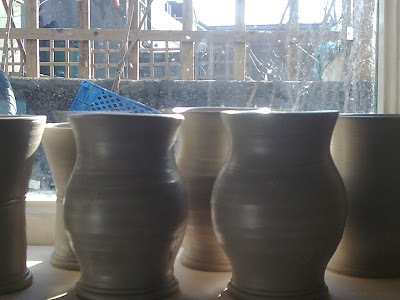 After a mug of tea to warm inside and out, I managed another eight mugs, bellied shape this time before my fingers became too cold and I was too tired after over two hour's throwing. By then it was dark, cold and wet! working on the new project. This morning the workshop in Abergavenny was too cold and the garden too- so I had alternative work- house cleaning! It is much more satisfying cleaning other people's homes...one is appreciated!! By lunchtime the sun was out and after lunch I turned the boardful of mugs and added the handles too. 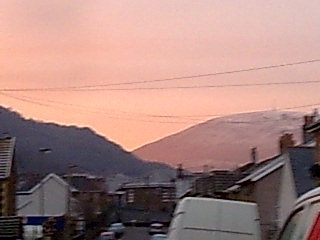 The sky clouded over again and although the forecast was not for frost it was feeling very like it as dusk approached. I covered the work with plastic and a towel...and we'll keep hoping!!. The shape is going well, the handles improving slowly. We're thinking now that we should be producing these in porcelain and aiming more up-market. Those already made wont go to waste and have been instrumental in my getting used to a new shape, different handles and a different wheel. We have been discussing glazing, now some have been bisque fired and we can move forward towards some finished work. Today was held the funeral of one Alun "Archie" Roberts, originally from Grangetown in Cardiff. The service was packed with family and cycling friends. It was a joy to hear old and true stories of him then, and later in his local pub in Llandaff North in Cardiff. It warmed the heart to have a vicar also from Grangetown with the real Cardiff voice too! It had been organised by his best friend, also originally from Grangetown. I'd first met him when he went to Southampton University in 1963 and came out on a local cycling club clubrun! I'd just started doing clubruns on my bike, with my father on his (instead of on a tandem). Archie I met in 1972 when I moved to Cardiff and joined the Byways Road Cycling Club. Some friends come and go, some you only see occasionally. Archie was the latter, but we always talked as if there had never been any time since the previous time we talked. It good to catch up with others too, as living twenty miles from most of them I don't see much of them atall. His best friend lives up in Yorkshire, the furthest travelled at the funeral, and the one I've seen most of, popping up in different places over Britain, usually with a bike!! I managed the funeral well, despite being squashed into a corner. I found listening to the poem by Dylan Thomas, "Do not go gentle...." very hard indeed. Sunset from Court Cupboard, Blorenge on the left. This is the view as I left the gallery yesterday, through the rainshowers that arrived just before I left. I have been given an award! Thankyou, Hawthorn!! Now I have to pass it on to others...a difficult choice indeed, so no complaints if I didn't choose you!! 1. A Devonshire Pottery A traditional slipware potter, who digs his own clay, makes beautiful jugs, sings, takes part in village productions and now shows us his hardworking days on video too. 3.Gary's 3rd pottery blog..pots, cooking, humour...Mr.Versatility!! 4.Henhouse Pottery...farmer, mother, potter...the simple life is hard work! 5. my family has been vegetarian for nearly 100 years, thanks to my grandmother, a fan of George Bernard Shaw, then a Theosophist and reader of Krishnamurti's writings all her life. 6. at my first school when I was three and a half they put the morning milk bottles, that had frozen and pushed their caps off...on the radiator to defrost....yeeeugh!! 7. I am going to finish the quilt I handpieced and half hand quilted in 1997/8.....honest!! From being stuck in two inch deep snow on Saturday afternoon, we had rain then frost in the evening. In the morning at 9am my car was still frozen, with frosty leaf patterns over the roof and windscreen...but within half an hour they had disappeared, long before the sun had reached the village, and the air was comparatively warm! The workshop was still well in shadow and too cold for work until after lunch. However the afternoon was productive and included throwing two dozen mugs, before I got too cold. They did take a little longer than hoped, but it is progress. The Wizzard spent most of Sunday tending to the computers in the house, updating and tidying. He missed Manchester's snow by spending the weekend here and it was good to see him. Hopefully he had a safe and clear journey home. Now it is Monday morning and I'm off to the Court Cupboard near Abergavenny for this month's duty day...lets hope the lane to the gallery isn't icy!! 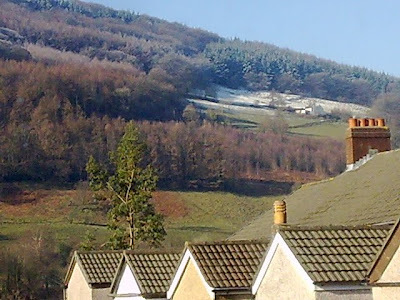 By 8.30 I was in Cwm y Glyn, starting to drop down towards Pontypool, and the snow started, small dry flakes settling on the be-rimed skeletal trees. As I neared Usk Farmers Market I was thinking...is this still a good idea? What was missing were most of the younger and middle-aged elements of our usual clientele. The old 'uns were out as usual, no stopping them! Needless to say I didn't cover costs, but again The Court Cupboard has been given much publicity, so hopefully we'll get business there. One woman wanted something similar to that she had seen on my website. I didn't have anything near enough to that today, but she'll go to the gallery to get what she wants. I did see an old friend, J, who makes cider and patchwork! It was good to catch up on our news and renew friendship. I seem to remember that I have half a box of interesting fabric for her in my stash. It has been there since 2008, waiting for her!! My brother and another friend helped me pack up, then we went to Usk Garden Centre in Llanbadoc for lunch and to warm up! They stock many Welsh varieties of fruit trees, but I wasn't going to browse around them in the snow. I'll be back when the weather improves, to say Hello to The Cat (aka The Boss) and to talk to people who aren't just working there, they know and love growing things. Home before three, then unload with the help of the Carpenter and the Wizzard (here for the weekend) and then try to find somewhere off the main village street to park. Not a good idea!! I ended up sliding part of the wrong way down a short hill back to the main street...and luckily the gap I'd left was still there. I'd forgotten that the only roads that get cleared are the bus routes. Today started well, packing up two bowls for fellow blogger gardeningbren in Canada. After a quick tidy, off to Abergavenny to turn and handle the mugs I made there last Friday. After lunch I threw another fifteen before it got too cold. Four o'clock and I had to go! Had I left it any longer the traffic would have been even worse, as it was it was busier than usual. I took a risk and followed the mountain road to miss a few miles of traffic jams. It was mainly two wheeltracks to follow between thawed and frozen slush on the way up, and between snow across the edge of the common. In a couple of places the snow was across the road, but I remembered my Man's instructions on how to drive over snow...and they were not very long anyway. Back in the village the cold is hard and heavy and the wind is brisk, making it feel even colder. The people inthe flat next door started door banging and kitchen clattering at 11pm...for over half an hour!! How I long to be back in a cottage. It is still chilly and although actually colder than yesterday it feels warmer. This is due to less wind, so a lower chill-factor. The sky is a hard clear blue, with a few fluffy clouds just starting to appear. The forecast is for even colder tonight. More office work today- I've weighed twenty pots with packaging, now to work out the postage and packing costs to add. I've posted two mugs on Etsy, the others will get "drip fed" onto the shop. I've just had a tenmoku glazed milk jug added to a treasury too. High time I learnt to do this myself, but computer time detracts from making . Although this cold weather gives me a chance to do more 'admin', there is a limit to how much I can stand doing! I'm envious of the makers who have partners willing to do this. If nothing else I'd get to drink my coffee whilst it was hot!! I'll draw and list the shapes and glazes I'll be making for the different shops and galleries in North Wales, today, keeping the 2D work going and co-ordinating eye, hand and brain. That will be proof of design work too, if I apply for membership to other associations or galleries. Now to make lunch and then the drying clay should be ready to knead and re-bag. Today was cold but bright and dry, so the washing on the line dried well. I signed the tenancy agreement for the allotment plot I'm keeping, now all we need is Spring! Today we are halfway between the Winter Solstice and the Spring Equinox...and the garden is frozen solid!! After lunch I got all the mugs handled, two bags of clay kneaded and re-bagged and four bags of clay each made into ten little hump-backed bridge shapes on a ware board to dryout enough to throw. Then on to a baking session...two onion quiches, a custard tart and half a dozen lentil and veg pasties. I think that this calls for getting handles on all the mugs that are in the house and concentrating on drying and preparing clay ready for serious throwing sessions any time that it is warm enough. Thinking of "Make Do and Mend", I mended my gilet pockets yesterday....good thing I checked the lining before mending the innerds of the second pocket....one penny is better than none! !